The Phantoms were back in action at Covelli last night for a little after-Thanksgiving action. This time it was to face off against the Madison Capitols, a team that is struggling but also coming off a big win against Dubuque and hungry for more. 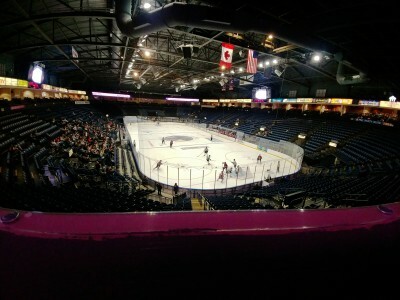 The Phantoms, for their part, are just trying to get back to .500, and this was the first introduction to the Covelli Center for a few new faces. The first period lacked a little bit of energy from both teams. Probably a little holiday lag for the Phantoms, and bus legs for the Caps. A little over midway through, it looked like the Phantoms were going to get a golden chance to get things going when the Caps took a couple penalties just 0:21 apart, giving us an extended two man advantage. However, it wasn't the Phantoms that would score first. Josh Boyer would block a shot from Connor MacEachern and from his knees, Boyer managed to fight off the stick of Gianfranco Cassaro, poking the puck to center ice between Cassaro and MacEachern for Chase Brand to take off on a breakaway. Brand made a forehand to backhand deke and went top shelf on the Phantoms netminder Vincent Purpura, making his first start as a Phantom. Monday morning hockey at the Covelli - The Phantoms beat the Flying Aces in a Monday morning tilt. Morning games on Monday's are a bit of an oddity, and finishing off a 3 game in 4 day series against a conference opponent, yet alone a team that is in second place in the East on a Monday at 10am is doubly odd. Maybe the time change had something to do with the lack of energy as well but neither the Phantoms nor the Flying Aces were at their best this morning. 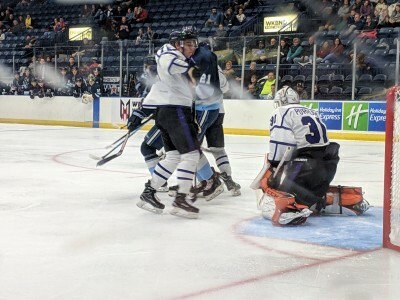 But the Phantom shook off the slow start and with some help in net, managed to earn another regulation win and are solidly out of the last place spot in the conference. It wasn't a good start for the Phantoms. An early bad change gave Aces netminder Mitchell Gibson and great oppertunity to send a long streatch pass just outside the Phantoms blueline where Tate Singleton was waiting. 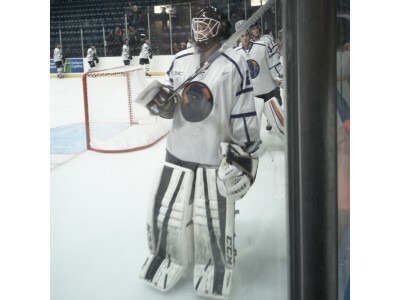 Phantoms netminder Christian Stoever cam far out of his crease to challange the shot, which he stopped. The rebound came back to Singleton just as a Phantoms defender got back. The Phantoms player's stick deflected the puck up where it fluttered right into the wide open net just 1:49 in. Most of the rest of the frame saw both teams showing the Monday morning blues until the Phantoms got a quick burst of energy late. First Jack Malone would get a great rebound chance off a Thomas Farrell shot on goal and Malone would put that in at 14:22 for his third goal of the series, one in each game. On the ensuing faceoff, the Phantoms would gain control at neutral ice and Brett Murray would carry the puck in. He would find the tape on the stick of Connor MacEachern, who had got in behind the Aces defenseman Colby Enns and MacEachern would beat Gibson with a backhand inside the far post, giving the Phantoms the lead 17 seconds after tying it. The Phantoms went into intermission up a goal with the shots tied at 6 a side. Stoever gets the nod. - Christian Stoever gets tapped to start after an impressive relief effort Friday and stopped 19 of 20 shots in his first win as a Phantoms. Sometimes I feel like I can't understand the thought process of teams in this league. They make moves that look iffy at best and in hindsight, are iffy at best. Then sometimes they make sketchy sounding trades and I eat my words when they turn out to work. Excuse me, I have a plate of stuff on the Christian Stoever deal that I had probably ought to chow down on while its still warm. After entering the game on Friday down 3 goals and earning us a point in the shootout loss, Stoever was tapped to start in net last night. The game lacked a lot of the energy of Friday's game and the Aces got on the board first, albeit much later in the frame. Cal Kiefiuk would dig a puck out along the boards below the Phantoms goal line and center a puck to Jeremy Davidson who slipped into a open area of the slot between a pair of Phantoms defenders. Davidson would one time the puck, beating Stoever stick-side at 13:47. The Phantoms would not get anything going in the frame, being outshot 11-4.